So I think I did a post a few months back telling you guys about how the pitcher and lid of my Ninja Blender died and went to Ninja Blender Heaven (i.e., they melted beyond repair in the stupid dishwasher of my apartment. Yes, I am still pissed off about that). It took me a while to finally get around to going to the manufacturer’s website to go and order the parts for my replacement and when I finally did, I got yet another unwelcome surprise: the model of the pitcher and lid that I needed was temporarily out of stock and there was no EDT on when they would be in stock again. Of course, this was something I wasn’t made aware of until AFTER I placed the order for them. Of course. To the company’s credit, they didn’t actually take the money out of my account until roughly about 3 weeks later when the pitchers were back in stock. A few days later and boom, the package came in the mail and I once again had a Ninja Blender that I could use. I was relieved, because God knows the motor stand had been looking uber stupid by itself on my countertop for the past three months or so. Now that I had my Blender back, I already knew the first thing I wanted to use it to cook. It was a recipe I’d seen a while back and gotten SUPER excited about…then got SUPER disappointed over because it would require the use of either an immersion blender or regular blender. Neither of which I had access to. Aarti Sequeira is still to date, my favorite of the winners of Next Food Network Star with Jeff Mauro coming in a close second. She’s just so bright and effervescent and it translates into her cooking, which mainly centers around Indian cooking. Indian cuisine isn’t something I’ve done a lot of cooking with, but I always knew that when I did finally give it a whirl, my introduction was going to be guided by Aarti. And as expected, she did NOT disappoint. I don’t know why I seem to have a habit of using recipes that I’ve never made before to feature on the blog. It’s somewhat of a risk considering that it might not actually turn out. But as with the others, this wasn’t the time that that happened. My first attempt at Chicken Tikka Masala was…. successful. As in “This chicken is long gone and I’m still thinking about and missing it like it’s an old friend” successful. The thing is, you will need a blender (or at least a food processor to make it). The first application comes from throwing together a ginger-garlic paste used to marinade the chicken AND flavor the sauce of the dish. There is a substitution option given in the recipe for it but I’m pleading with you… if you’ve got the tools, just take the effort and initiative to make the paste. Please. Your taste buds will thank you. The second use of the blender comes in with pureeing the tomato sauce down so that it’s smooth. I didn’t mention this in the print out version of the recipe but I’ll go ahead and say it here: I have seen what happens when you put a hot liquid substance in a blender and crank it up high right off rip. It ain’t pretty. Don’t do it. Before I even pureed the tomato mixture I took it off the heat and let it cool down for about 5 minutes or so. Even after that, I pureed the tomatoes in increments, and it only took about three blends before everything was ready. And most imporantly: I avoided making a HUGE mess. Just as you should. 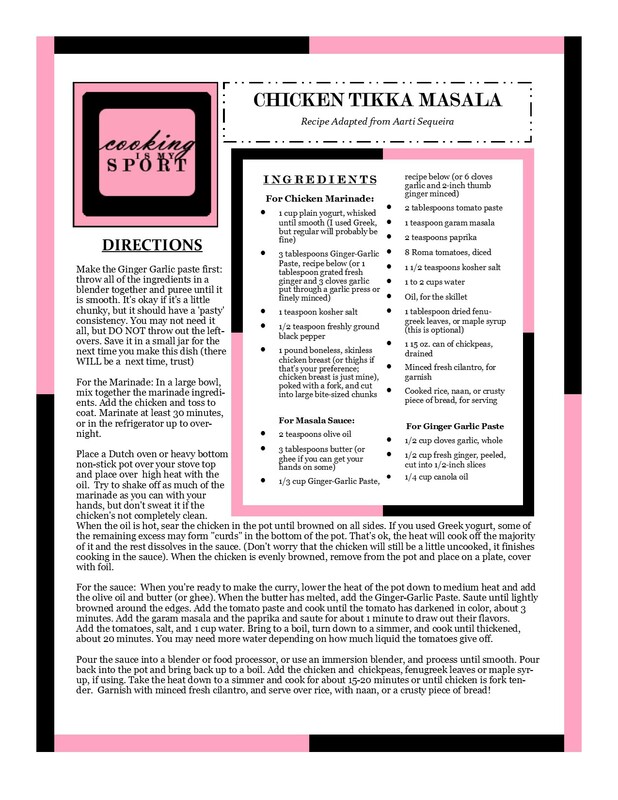 My take on Chicken Tikka Masala differs from Aarti’s in several ways: number one, she used plain yogurt in her marinade. I don’t know, but whenever I marinade chicken in yogurt I am always predisposed to using Greek. I went ahead and did the same thing here and I don’t think it caused any huge issues. Second, Aarti grilled her chicken before adding it to the tomato sauce. Most of you guys already know how grills and I get along (We Don’t. The End. ), so I did go ahead and just sear my chicken in oil on the stove top. Once again: I think it was a perfectly fine substitution, but if you’d prefer to grill it, by all means do so. People stay hating on using chicken breast in cooking. I really don’t care. I know how to cook it so that it’s not dry and chalky and a hot mess soooo, I will always, ALWAYS default to chicken breast. Who’s gon check me, boo? This dish cooks down to a stew like consistency and since I like extras in my stew, I went ahead and threw in a can of chickpeas to give the dish some extra protein. It was a good choice. What can I say about the taste? Well I have to admit that going into making the dish I was worried about the acidity of the tomatoes overpowering everything else. That doesn’t happen. The Ginger-Garlic paste provides SUCH a strong and effective counter balance to the tomatoes. The chicken cooks down so nice and tender in the sauce–and I gotta say I think that Greek yogurt really helps in making it stay moist. Your tongue and stomach will just want to give you a great big hug after you eat a huge bowl of this stuff. Mine did. Oh yes! And eating bread on the side with this is just mandatory. Naan bread, preferably. Where are you supposed to get Naan you ask? Right here Silly Billy Gum Drops. Your’re welcome. Happy Fiesta Friday #122 on this the first week in June!, co-hosted by Mollie @ The Frugal Hausfrau and Aruna @ Aharam. Place a Dutch oven or heavy bottom non-stick pot over your stove top and place over high heat with the oil. Try to shake off as much of the marinade as you can with your hands, but don’t sweat it if the chicken’s not completely clean. When the oil is hot, sear the chicken in the pot until browned on all sides. If you used Greek yogurt, some of the remaining excess may form “curds” in the bottom of the pot. That’s ok, the heat will cook off the majority of it and the rest dissolves in the sauce. (Don’t worry that the chicken will still be a little uncooked, it finishes cooking in the sauce). When the chicken is evenly browned, remove from the pot and place on a plate, cover with foil. For the sauce: When you’re ready to make the curry, lower the heat of the pot down to medium heat and add the olive oil and butter (or ghee). When the butter has melted, add the Ginger-Garlic Paste. Saute until lightly browned around the edges. Add the tomato paste and cook until the tomato has darkened in color, about 3 minutes. Add the garam masala and the paprika and saute for about 1 minute to draw out their flavors. Pour the sauce into a blender or food processor, or use an immersion blender, and process until smooth. Pour back into the pot and bring back up to a boil. Add the chicken and chickpeas, fenugreek leaves or maple syrup, if using. Take the heat down to a simmer and cook for about 15-20 minutes or until chicken is fork tender. Garnish with minced fresh cilantro, and serve over rice, with naan, or a crusty piece of bread! It’s SUPER easy to do Heather, especially when you just make everything on the stove top. I swear to God, I do NOT get the chicken breast hate. To me it’s my favorite part of the chicken, even above the thighs lol Thank you, I think you and Matt would like this dish! I have only recently been introduced to Indian food, and am really enjoying learning about it. I had chicken tikka masala for the first time at a restaurant a couple weeks ago. It was really good. But yours looks way better! I would love to try it sometime. I have some Indian spices left from when I made my son an Indian dinner, so I wouldn’t even have to buy that much. Thanks, Jess! Wow your dishwasher gets hot, melting the top of the blender holy cow. Love my Ninja. Your dish looks amazing and is one of my favorite Indian dishes. Yeah, it’s a crap dishwasher Suzanne. I don’t even use it anymore. I’m not losing anymore dishes to that monster lol Thank you! I think this dish is always a pleaser! This looks amazing, and Happy FF, Jess! This was my first time making it, and it sure pleased me! Thank you! Who can turn down such delicious looking Chicken Tikka Masala! Thank you for bringing this delicious dish to the party at Fiesta Friday! I would happily serve this with white rice! 😀 Looks so mouth watering, Jess! Oh I feel your pain! Welcome home Ninja! This dish looks delicious and I would have to have a piece of Naan with it too. Gasp! I was just thinking of Indian food! I am NOT kidding! In fact I was just saying to hubster we haven’t had Indian in a while. And now this! You’re a cruel woman, Jess 😀 It looks fabulous!! Ow – that looks very tasty! Gonna try it out tomorrow!